The waved albatross gets its name from the wave-like pattern on its wings as adults. They have a distinctive yellow or cream neck, a long bright yellow bill and blue feet. They breed primarily on Espanola Island and this area is very important to the birds. During the non-breeding season they move to the coasts of Peru and Ecuador. They are threatened by long-line fishing as they can get caught on the hooks while catching their prey and by tourism which disturbs their nesting sites. 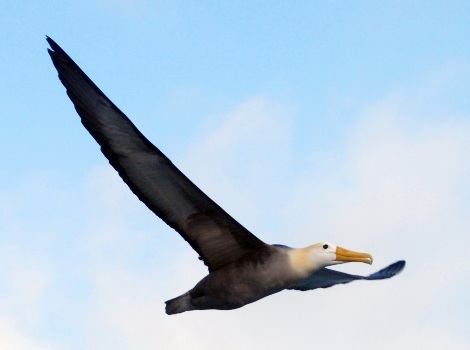 It is also known as the Galapagos albatross.